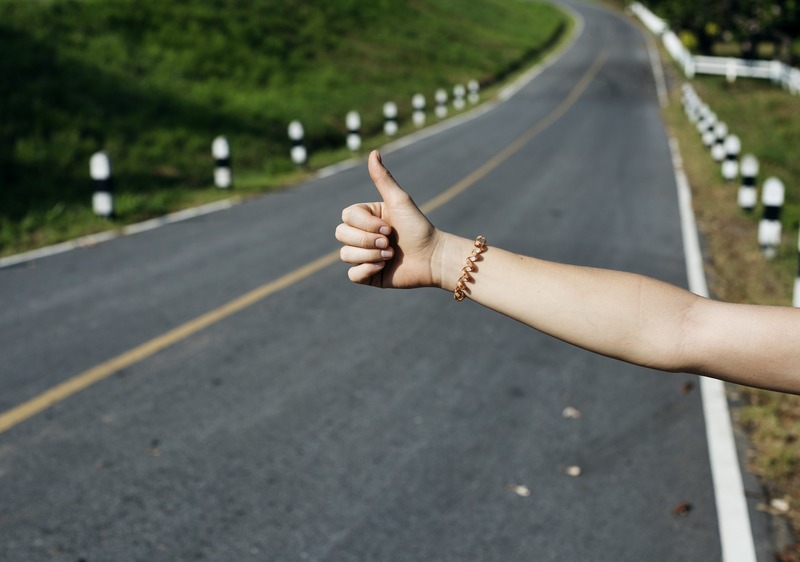 Home » Musings » Do You Pick Up Hitchhikers? Would you invite a hitchhiker into your car? Sunday afternoon I drove down California’s Highway 1 from Carmel to San Luis Obispo. It’s a beautiful drive…I haven’t done it in about 10 years…and I appreciated the beauty of the California Coast. After horrific fires and mudslides a couple years ago, the highway has been closed in the Big Sur area and only recently re-opened. Anyway, I was mildly surprised at how many hitchhikers we passed. Maybe it is just because I live in Los Angeles, but the USA has never struck me as a very hitchhiker friendly place. Then again, I’ve hitchhiked twice in my life…in a sense. Both times in the USA. I am not inherently opposed to picking up hitchhikers. In my roll as husband and father, I took the cautious path and did not pick up anyone, but I did seriously ponder it. Not so much because I wanted to have conversations with the hippy/bohemian-looking backpackers, but because I was reminded of the golden rule. My first hitchhiking incident was in March of 2006 in Newport, Rhode Island. My brother and I were spending a few days in the Providence and Boston area and wanted to check out the mansions in Newport. We were poor students at the time and took RIPTA, the public transport bus system, to get there. But these are sprawling properties and walking from mansion to mansion takes time. As the crisp March day grew cooler and the sun began to set, we noted that we had to get to The Breakers (Vanderbilt mansion) fast or else we would miss the last tour. I was too young to rent a car at the time and so I took Amtrak to Harper’s Ferry and spent the night there. Early the next morning I arose before dawn and spent a wonderful few hours exploring the area. My return train to Union Station. the Capitol Limited from Chicago, departed at 11:31AM and was to arrive at Union Station at 1:05PM. That would give me time to comfortably take public transport back to Dulles for my 5:50PM flight to Los Angeles. Small problem. Chronically late Amtrak was delayed eight hours! I had no money for a cab back to the District or closest Metro station. So I went to a parking lot, scoped out DC license plates, and hit up a young couple returning to their car with a request: can you take me back with you? Had I been traveling alone, I would have picked up a hitchhiker or two without much further thought. With my family in tow, the calculus became more complicated. Nevertheless, I hope to pick up many hitchhikers in the months and years ahead. What do you think about hitchhiking? I think I would have picked up hitchhikers along Highway 1. Maybe a different story along Interstate 5 near San Onofre! With the exception of an emergency such as a blizzard in the middle of nowhere, no. I’ve only picked up a hitchhiker once. At the Cockscomb Basin Wildlife Refuge in Belize, the public bus only brings you as far as the access road in a village a few miles from the actual entrance, so it isn’t unusual to see backpackers asking for rides (for that matter, hitchhiking in general is quite common in Belize). I offered a ride to a Spanish couple trying to walk down to the park entrance, and we agreed to meet back up in a few hours to ride back to the village. The weather was nasty that day so they were grateful to be out of the rain even for a few minutes. My wife and I enjoyed a nice conversation with them. Reflecting back on it 5 years later, it was certainly a small but “enriching” part of that trip. Today, my son’s still afraid of strangers, so that alone would stop me from picking up a hitchhiker. Putting that aside, I guess it depends on where we’re talking about. If it’s someplace where hitchhiking is common (I’d put the PCH in that bucket), maybe. On a random stretch of interstate somewhere? No way. While driving from Kansas to Lexington, KY my senior year of college, the hood of my friend’s car starting smoking about 1 hour outside of Louisville. About 10 minutes after we pulled off to the side of the road and removed our luggage, the car’s engine exploded into a huge fireball, closing an Eastbound lane of I-70 for over an hour. Thankfully no one was injured. A friendly trucker that had pulled over allowed my friend and I to ride in the back of his cab and dropped us off at a Rite-Aid in Louisville where we used a payphone to call a friend in Lexington to drive to Louisville to pick us up. We bought a 12-pack and sat on the curb a couple hours before catching a ride to Lexington. Thank goodness for the friendly trucker. When we rented the car in St. Lucia, we were told that hitchhiking was safe. Picked up a couple of hitchhikers — our only time we did that. The funny thing is that driving is on the opposite side we are accustomed to. My wife’s erratic driving for the first few kilometres in the morning was the talk of the small island by the late afternoon! Yes but it is location dependent. We vacation frequently in the Virgin Islands and on some of the islands, hitchhiking is an accepted means of transportation. Where our weekend house is located, we get a fair share of fly fishermen, hikers and kayakers they lose track of time and distance. We pick up at least 5 per season that are in need of a ride back to their cars. random people along highways? Never. Every time I’ve picked one up it’s been a combination of drunk, crazy, and smelly. Not worth it unless it is an area known for shuttling (hiking areas, backcountry skiing areas, etc.). I sometimes feel guilty as I pass, and then I remember the mentally unstable dude in coastal Washington that went from tears to anger multiple times during a 30 minute drive. Clearly you’re too young to remember the Hillside Strangler ( and dozens of other cases involving hitchhike murders, around the world). Picking up hitch-hikers only encourages them to continue this extremely dangerous behaviour.